Opened in 1899, Raffles Hotel is a colonial-style luxury hotel in Singapore, and one of the world’s most famous properties. 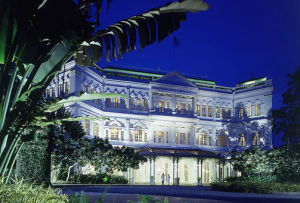 Named after Singapore’s founder Sir Stamford Raffles, and often voted top luxury hotel in the world, the suites boast teak-wood floors, handmade carpets, and 14-foot ceilings. The hotel houses a tropical garden courtyard, museum, shopping boutiques, Victorian-style theatre, restaurants, and the legendary Long Bar. The Long Bar’s two-story earthy decor was inspired by the Malayan plantations of the 1920s. The storied Long Bar is where the Singapore Sling cocktail beverage was invented, and which was patronized over the decades by a host of literati, including American author Ernest Hemingway. The exact same Singapore Sling Glasses that we bought as souvenirs (and still possess) almost twenty years ago, are still available for purchase today. Some things never change!